It’s Monday and that means BBC Sport pundit Garth Crooks is back with his Premier League team of the week and he’s sparked a mini backlash due to an Arsenal snub. An ongoing criticism of Crooks when it comes to his selections is that he often plumps for those who have scored over the weekend, and his XI this time round could potentially leave him open to that same scrutiny. Nevertheless, David De Gea kicks things off between the posts, and although he did play an influential role in Man Utd’s draw with Wolves, it could be argued that another shot-stopper was more deserving of a place this week. As per Sky Sports, pundit Graeme Souness picked out Petr Cech as a star performer as he earned the man-of-the-match award to help his side keep a clean sheet and secure all three points against Everton. In turn, it’s relatively obvious that he was influential and arguably deserved the nod ahead of De Gea, regardless of whether or not the Spaniard was key. As per the tweets below, it’s apparent some fans agreed, but ultimately Cech wasn’t given the recognition this week but he’ll surely take enough away from helping his side seal another win. 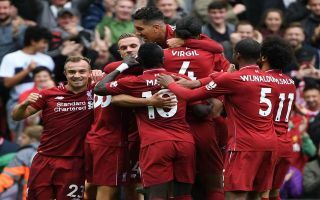 In defence, Joel Matip is included after his performance in the win over Southampton, in which he also scored, while Danny Rose and Issa Diop sit either side of him after influential displays for their respective sides. If we were being picky, playing Rose in a back three doesn’t make a great deal of sense, but evidently Crooks wanted to fit in other players and so has adjusted his system accordingly. Aaron Lennon, James Maddison and Ilkay Gundogan were all on the scoresheet this weekend and make up the midfield along with Diogo Jota, and while arguments could be made in favour of them, as mentioned above, it appears that scoring certainly helps your case when it comes to Crooks making his picks. Up top, Sergio Aguero is part of an attacking trident after bagging his 205th goal in 300 appearances for Man City as he continues to be a prolific presence in their line-up having started the scoring in a fine win at Cardiff City. Alexandre Lacazette joins him up top after his great goal against Everton, while Raheem Sterling completes the XI as Crooks picks him as being a constant menace for the reigning Premier League champions and so he arguably does deserve the nod. As ever, features like this one are down to opinion and so many will disagree and pick out those who were snubbed. Particularly with regards to Cech though, Crooks may well have got it wrong this week but his XI below all undoubtedly make a case. Cech was brilliant today, he had 6 saves and a clean sheet. He deserves a spot.